All items on this page are available to download free of charge. For multiple copies we charge 20p per item, unless otherwise stated. To place an order, please click on the button to order via PayPal or use the online order form (opens in a new window). An animated story of how schooling for disabled children, or those identified as having "special educational needs", has evolved over time. This leaflet outlines the philosophy underpinning our work and describes CSIE activities and the services we offer. Individual copies can be downloaded free of charge. This information leaflet summarises relevant legislation, introduces the revised Code of Practice and describes the assessment and statementing procedure, including outline details of: special educational needs appeals; reviews and amendments to statements; and change of school and leaving school. It also lists contact details of relevant organisations and other sources of information. Information leaflet on previous work of the Centre and the philosophy behind including children in mainstream schools. Report of CSIE’s 2001 national conferences in London and Manchester which aimed to provide a platform for learning supporters to express their views. The report focuses on supporters' recommendations for developing their work. Priorities for change include: pay, conditions, working with teachers, working with pupils with high level support needs, training and qualifications. Two colour posters (A4 size) - photographs of inclusion, with the message 'Inclusion: Human Rights and Social Justice'. Information leaflet on Article 24 (Education) of the United Nations Convention on the Rights of Persons with Disabilities (2006) which emphasizes disabled children's rights to an inclusive education. The leaflet also offers information on the Convention's relevance to UK schools, relevant UK legislation and guidance, and a range of useful resources. The leaflet opens up to an A2-sized poster designed to be displayed in schools. This A4 leaflet outlines the key reasons against segregated special schooling for disabled children. 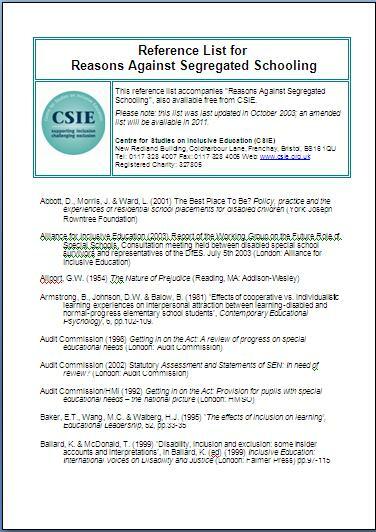 Five pages of references that support the leaflet, 'Reasons against segregated schooling' (see above). Colour A4 poster outlining arguments supporting the inclusion of disabled children in mainstream schools. Drawn up by CSIE in 1989 and now signed by a growing number of organisations, LEAs, Trade Unions, MPs and Peers. 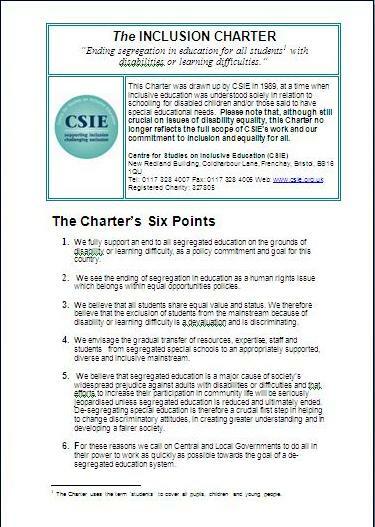 This six-point Charter calls for the phasing out of special schools for educational and human rights reasons and includes a revised explanatory back-up paper. Find out more about our charter.